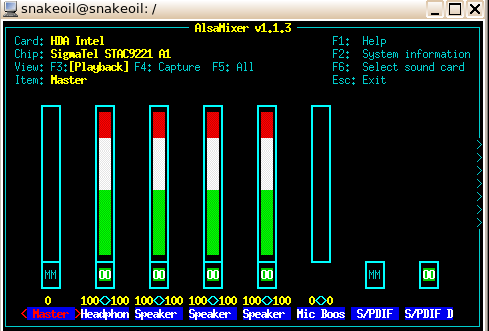 Here's the preview ISO of the next version of SnakeoilOS. Any bugs/issues please report in this thread. I'd try and fix 'em as soon as I can. For those who have activation codes, they'd still work with this and future releases. People without code, sign up to the forum and PM me for one (You'd get one for F-R-E-E). Request your activation code before the official 1.0.0 final is out. Once 1.0.0 is officially released the only way to get a code is by donating to the SnakeoilOS project. Edit: Forgot to mention - ignore the sound quality aspect for now and focus on the web-app and overall use. Once the documentations is updated to the latest edition I'd work on the audio. Go into System, drag the downloaded file into the install box to update your firmware. snakeoil-0.8.5-x86_64.fw (Size: 12.23 MB / Downloads: 4) For the 5 people who are using 0.8.4 on 64bit OS now, please refer to this post to fix the update bug before updating. Everybody else should be able to update straight to 0.8.5 without issues. What do you mean Client disabled? Maybe this is my problem? Network mount is gone after restart. After re adding LMS database still there. None of MPD servers(players) work. Internal music folder synchronised with added NAS mount. 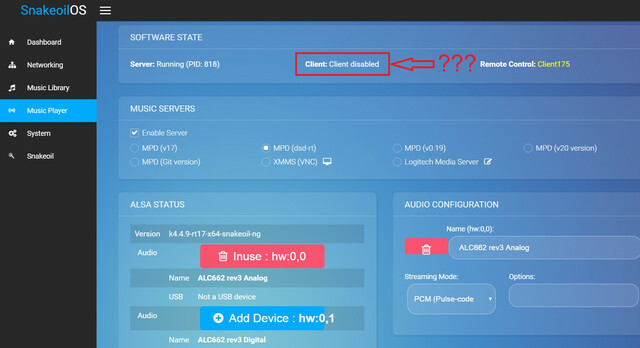 Qualcomm® Atheros® AR8171 network adapter not work. LMS+Squeezelite 1.8 works fine and sounds good already on XMOS. (30-May-2017, 09:46 PM) [email protected] Wrote: No sound. (30-May-2017, 11:47 PM) polarlight Wrote: No sound. My bad for that. The volume is muted and turned all the way down by default. SSH into the computer, and run the following to turn it on. Also, what browser, device are you running on? The fonts and buttons seem a bit out of whack. (30-May-2017, 11:47 PM) polarlight Wrote: What do you mean Client disabled? Maybe this is my problem? MPD (server) don't require an "additional software" (client) to run because it is self contained. I'd update the manual with these new terminology once the i686 ISO is released. (31-May-2017, 01:46 AM) sips Wrote: Network mount is gone after restart. After re adding LMS database still there. That's a bug.. My bad for that. Will try and test that and fix it in the next firmware release. (31-May-2017, 01:46 AM) sips Wrote: None of MPD servers(players) work. 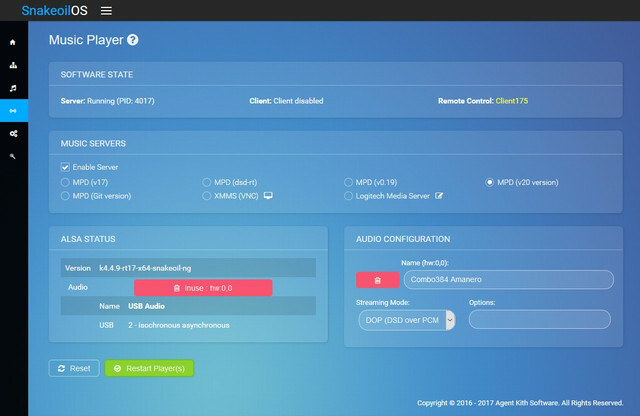 MPD disables software volume mixer by default. That will be addressed in the next release. (31-May-2017, 01:46 AM) sips Wrote: Internal music folder synchronised with added NAS mount. (31-May-2017, 01:46 AM) sips Wrote: Qualcomm® Atheros® AR8171 network adapter not work. Thanks for that. I'd support that in the stock kernel in the next ISO release. (31-May-2017, 01:46 AM) sips Wrote: LMS+Squeezelite 1.8 works fine and sounds good already on XMOS. Keep the bug report coming guys. And sorry to have you guys download/install/reinstall. The more people who are testing this, the more polished the final release will be. And as mentioned previously, PM me if you don't already have an activation code. Test and run everything you can and let me know of any problems (or confusion, e.g. the "client" reference). Quote: sips Wrote: Internal music folder synchronised with added NAS mount. The snakeoil system music folder, if I open it from other pc show same as my mounted nas folder. 2 folders in mirror. snakeoil\music=nas\shared folder. Maybe it is normal, not a bug. (31-May-2017, 12:10 PM) sips Wrote: The snakeoil system music folder, if I open it from other pc show same as my mounted nas folder. 2 folders in mirror. snakeoil\music=nas\shared folder. Maybe it is normal, not a bug. can you take a picture? Thanks. For the relevant outputs, set all the volumes to max (Arrow up all the way). Then press "M" so that "MM" reads 00 (unmute). The audio should work then. Edit: Nice find on the MPD-RT bug.. I'd look into that later today or tomorrow when I can. A bit overwheld @ work righ tnow.